Transparent media is a way to strengthen relationships and trust with communities and the media on a local level. It can be useful in understanding the difference between representative news and fraudulent news. With many different news platforms available, it is important for news consumers to be aware of how news stories are developed and conveyed. PEN America with Open Media Foundation hosted a Newsroom Transparency panel discussion with notable writers and media makers including moderator and reporter Donna Bryson, Patricia Calhoun, Deblina Chakraborty, Bruce Ducker, and Nathaniel Minor. This conversation emphasized the need to access information in defense of a free press. The panel also highlighted Newsroom Transparency indicators and their importance for news consumers in growing media desert communities. Indicators of interests were: Ethics Policy, Fact-Checking Policy, Corrections Policy, Unnamed Sources Policy, and Diversity Staffing Statement and/or Policy among others. This discussion also included a Question & Answer session to end the first panel discussion for audience members. PEN America invited questions in person or through the RSVP form for those that could not attend. 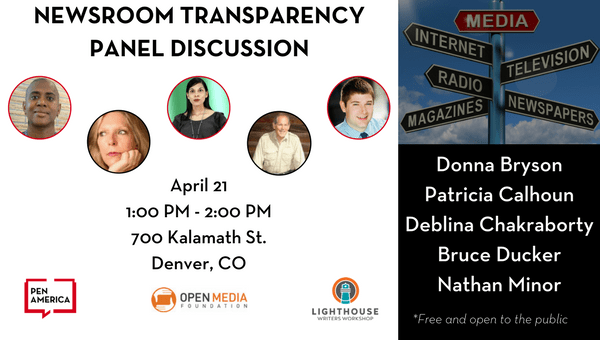 Panel Moderator: Donna Bryson is a Denver-based author and freelance journalist who also has lived in and reported from South Africa, India, Egypt and the UK. Her new book, Home of the Brave, explores the challenges a small Colorado town overcame when the community decided to be a more welcoming place for military veterans. Her previous book, It’s a Black White Thing, portrays race relations among young South Africans and won first place in the non-fiction book category of the National Federation of Press Women’s 2015 Communications Contest. Patricia Calhoun co-founded Westword in 1977; she’s been the editor ever since. She’s a regular on the weekly “CPT12 roundtable Colorado Inside Out,” played a real journalist in John Sayles’s Silver City, once interviewed President Bill Clinton while wearing flip-flops, and has been honored with numerous national awards for her columns and feature-writing. Deblina Chakraborty worked in magazine publishing for several years before falling down the rabbit hole of digital journalism in 2009. Since then, she’s written, edited and programmed content for Discovery Communications, HowStuffWorks.com and CNN Headline News, and for more than two years, she hosted the award-winning podcast “Stuff You Missed in History Class.” In 2013, Deblina helped run HLN’s digital coverage of the Jodi Arias and George Zimmerman trials, including editing daily live blogs that were picked up by multiple media outlets. Now, as a digital director for The E.W. Scripps Company at Denver7, she manages a team that’s working to reimagine how local news is covered and presented online. Bruce Ducker has written eight novels and a book of short stories. They have won the Macallan Prize and the Colorado Book Award (Lead Us not into Penn Station); and have been nominated or short-listed for the American Library Association Best Book Award, and the Pulitzer (Marital Assets). His work has appeared in the nation’s leading literary journals, including Poetry Magazine, the New Republic, and the Yale, Southern, Sewanee, Missouri, Literary, and Hudson Reviews. He and his wife Jaren live in Denver and outside Aspen. Nathaniel Minor is a journalist at Colorado Public Radio. He’s reported on development, agriculture and food from Africa; European trade issues from Vienna, Austria, and environmental, transportation and poverty issues from Colorado. In 2017, he was part of a small team that reported and produced The Taxman, an in-depth podcast on Douglas Bruce and Colorado’s Taxpayer’s Bill of Rights. He lives with his wife and dog Watson in Denver. We hope you joined us for our follow-up “Who’s Behind the News” panel discussion, livestream viewing of PEN America’s “Fighting Fake News” discussion at the World Voices Literary Festival featuring Peter Barbey, Jill Abramson, Bill Kristol, Yamiche Alcindor, and Suzanne Nossel. 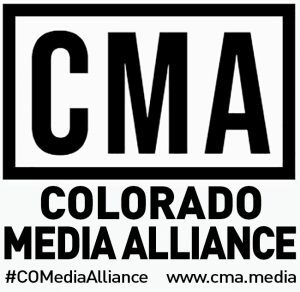 Feel free to also inquire about our closing reception in Denver in support of Colorado Journalism Week. *This event was made possible through PEN America’s Press Freedom Incentive Fund in partnership with Open Media Foundation, Lighthouse Writers Workshop, and the Colorado Media Alliance.